When it comes to Easter recipes for kids, I think its all in the decorating. I make the cutest chick cookies for Easter that are always a hit with my kids. I use a basic sugar cookie recipe (the Betty Crocker one is my favorite but I use butter) and a baby chick cookie cutter. 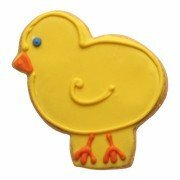 For the icing, I use a powdered sugar icing and help the kids decorate the Easter cookies using a bright yellow, with bright orange for their feet and beak, and a little blue disc for their eye. You can find the confetti discs in multi-colors in your local grocery store and then just pick out the blue ones for the eyes. I also help the children make cupcake baskets using icing and the grass tip of the icing applicator rather than the usual coconut. I then let them pick 3 small jelly beans to apply to the center. For basket handles, we just use pipe cleaners cut in half. Really, kids and adults love these and they can almost be considered Easter crafts for children because they will absolutely LOVE making them. Here are the recipes for the cookies if you want to give it a try. 1. Mix powdered sugar, butter, vanilla, almond extract and egg in large bowl. Stir in remaining ingredients except granulated sugar. Cover and refrigerate at least 2 hours. 2. Heat oven to 375ºF. Lightly grease cookie sheet. 3. Divide dough in half. Roll each half 1/4 inch thick on lightly floured surface. Cut into desired shapes with 2- to 2 1/2-inch cookie cutters. Sprinkle with granulated sugar. Place on cookie sheet. 4. Bake 7 to 8 minutes or until edges are light brown. Remove from cookie sheet. Cool on wire rack. Here's a link to a page that has several suggestions for things you can use in place of eggs as an egg substitute. One option is simply to add 1 tsp. of canola oil for every egg you are replacing in the recipe when using a prepared egg substitute to improve the texture of the end product. There is quite a selection and variety of suggestions, so you can experiment with a few and find one that suits you and your son the best. Let us know what you come up with and what is your favorite egg substitute. When I use a egg subsitute nothing cooks right such as cake brownies,cookies. I have a son that is allergic to eggs any suggestions?